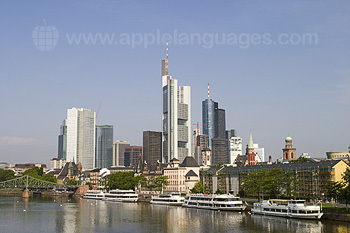 Frankfurt am Main is the financial capital of Germany, and of Europe. 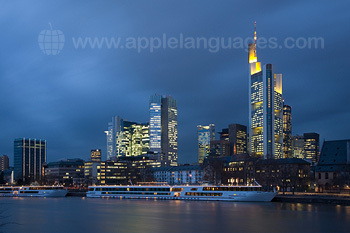 Learn German at our language school here, and discover everything that Frankfurt has to offer, from wonderful nightlife and incredible shopping, to historic monuments, concert halls and theatres. 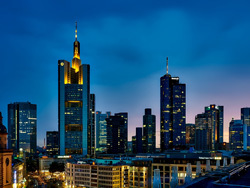 As well as the towering skyscrapers that dominate the skyline, Frankfurt is home to St Paul’s Church, the birthplace of German democracy, many remarkable museums and much more. It is also the birthplace of Goethe, Germany’s most famous author and poet. 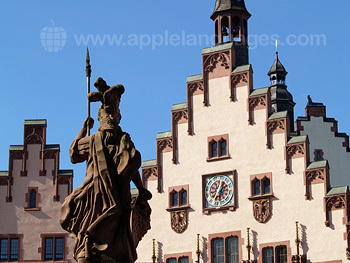 A language course at our German school in Frankfurt enables you not only to learn and use the German language, but to encounter both modern Germany and fascinating insights into Germany’s long history and culture. 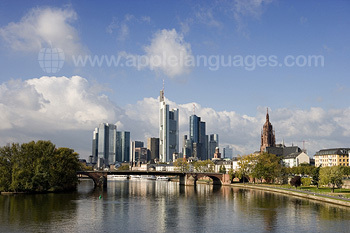 Our German language school in Frankfurt is centrally located, in the city's Sachsenhausen district where you will find most of Frankfurt's historic buildings. 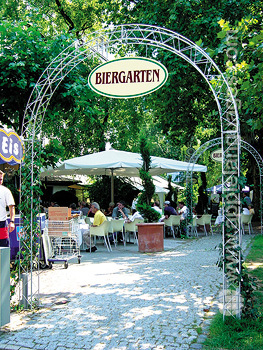 This is a really interesting area of Frankfurt, and the school is just 10 minutes away from River Main where some of Frankfurt's best museums, restaurants and bars can be found. In the summer, students can also take advantage of the sandy beaches along the river bank. The school has excellent facilities with 7 spacious, well-equipped classrooms, and a modern self-study and Internet room where you can get drinks in between classes. The school offers a wide range of German language courses, including an Intensive German Course, including either 20 or 24 lessons each week and a Super Intensive German Course, including 28 lessons each week. Courses are available for students of all levels for durations from just 1-week to 36-weeks. 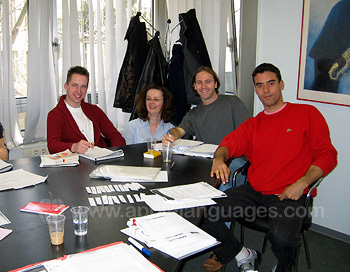 Courses are also available, combining group German lessons with 5 or 10 private German lessons/week. For those who wish to take a German language exam, there is a ‘Zertifikat Deutsch’ Exam Preparation course. Teacher training courses are also available for German language teachers, which includes 26 lessons each week and covers useful and interesting topics, such as the use of contemporary teaching materials in lessons and new trends in teaching methodology, as well as offering teachers the opportunity to observe German teachers in practice and discuss new ideas with your colleagues. Our school also arranges Work Experience in local German companies, for students who want to stay on in Frankfurt after finishing their German language course. To participate in this programme, you should be at least 18 years old and a citizen of the Europe, the United States, Switzerland, Japan or Australia. 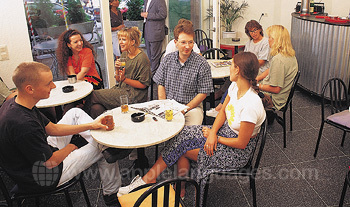 Students can stay in shared student apartments, or else in carefully selected German host families. If you want to learn as much German as possible during your time in Germany, our school in Frankfurt advises students to stay in German host families, as you will then practise in your host family the German language skills that you learn on your course. Students who are at least 18 years of age can also select student residence accommodation. With this option, you will have your own bed room and private bathroom, and also have access to free wifi access, laundry facilities, a shared kitchen and 24-hour reception. Student residence ‘plus’ accommodation is available which offers a higher standard of accommodation and also includes air-conditioning, a TV and hairdryer! Our Frankfurt school also organises a cultural program, including a guided tour of Frankfurt, a welcome meeting, visits and excursions, to help international students at the school practise out of class the German language skills that they learn on the course. Our Frankfurt school arranges airport transfers from Frankfurt Airport, for students who prefer to be met on arrival and taken to their accommodation. Average score for our school in Frankfurt based on 9 previous client reviews. Teachers were very good. Good mix of students, all friendly. Wish I had the time to complete the first level. My host was friendly and provided all the information and help I needed or asked for, room good - had all I needed. All facilities shops/parks/bars/trains etc very close by, but a little bit too far from the school for my liking. Would have preferred it to be in walking distance. Thanks. I enjoyed the experience. Definitely would like to do again. The course was good, following a working book very well structured. I only missed more conversation time during class, like discussion moments involving the whole class so we could improve our oral abilities. Sometimes it was too much the teacher speaking and we only listening. But overall it was a very good course! EXCELLENT! Couldn't have had a better accommodation. I staid at the Smartments at Athener Straße, 6. Really good, just what I needed for the 3 weeks I staid in Frankfurt. Good bed, great shower, a small but sized just right kitchen and good heater. Loved it. Good WiFi as well. This was the second course I took abroad using Apple Languages and I strongly recommend it. Staff very friendly and the schools chosen to provide the course are high quality. I had two teachers of totally different personalities. Both were excellent. As it was the month of August the class was quite big but it did not take away from my enjoyment. My hosts could not have been nicer. I really felt at home there. The male host had a similar taste of music to mine. We had some great music sessions consisting of rock, pop, blues and Irish ballads. He played the guitar and I did most of the singing. There were always plenty of others to join in. Both my male and female hosts made my stay a really memorable one. I found the lessons very beneficial wth regards to grammar. 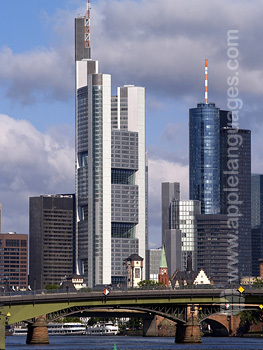 After attending my course in Frankfurt I felt I had a better grasp of german grammar. I enjoyed the course a great deal. I enjoyed my stay in Frankfurt. The course was exactly what I needed and the family were friendly. My accomodation was good. I had a nice room in a big house and had my own bathroom. The breakfasts were good and the owner was very helpful. Great course - I enjoyed it. The style of teaching was great in that the teacher gave her instructions and explanations in German, resisting the use of English whenever possible, and I found that particularly helpful since it encouraged me to concentrate harder & understand German speech patterns much more clearly.